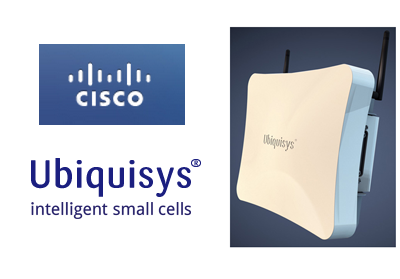 Ubiquisys, which is headquartered in Swindon, U.K., offers a line of small cell base stations for enterprises, indoor public access, residential, and outdoor rural applications. The products listen to neighbouring cells continuously, adapting to changes to ensure optimum user experience with no interference problems. Ubiquisys also features adaptive techniques that enable public access metrocells to match macro network service quality KPIs when deployed in capacity hotspots. Cisco said the acquisition will expand its mobility portfolio with indoor small cells across radio networks. The deal builds on Cisco's recent acquisitions of Intucell and Broadhop (part of Cisco Quantum mobility software suite). Ubiquisys' technology will further bolster Cisco's mobility solutions by adding dynamic intelligence at the end of the network via small cells providing mobile users with a more reliable voice and data experience. "Cisco is 'doubling down' on its small cell business to accelerate strong momentum and growth in the mobility market," said Kelly Ahuja, senior vice president and general manager, Cisco Mobility Business Group. "By acquiring Ubiquisys, we are expanding on our current mobility leadership and our end-to-end product portfolio, which includes integrated, licensed and unlicensed small cell solutions that are tightly coupled with SON, backhaul, and the mobile packet core. For service providers, Ubiquisys supports cost effective coverage and capacity that delivers a differentiated customer experience." Ubiquisys investors include Accel Partners, Advent Venture Partners, Atlas Venture, 5 Continents Consulting Group (5CCG), Pacific Venture Partners, SerComm Corporation, UMC Capital Corporation, Yasuda Enterprise Development Co and T-Mobile Venture Fund. A redacted interview between Jim Carroll, Editor of Converge! Network Digest and Manish Gulyani, VP of Product Marketing, Alcatel-Lucent / Nuage Networks. Converge! Digest: How do you describe the Nuage Networks' solution? Manish Gulyani: The Nuage Networks Virtualized Services platform is a software-only solution for fully automating and virtualizing data center networks. That’s our main value proposition. As you know, today’s data center networks are very fragile, they use old technology, and they are very cumbersome to operate. When we looked at cloud services, we found that storage and compute resources had been virtualized quite nicely, but the network really wasn’t there. We saw a great opportunity to apply the lessons that we have learned in wide area networking along with SDN. The idea is that if you want to sell cloud services, you need to support thousands of tenants. And you want each tenant to think that they own their piece of the pie. It has to feel like the experience of a private network, with full control, full security, full performance of a private network but with the cost advantages of a cloud solution, which is a shared infrastructure. That’s what we’re bringing to the table with the Nuage solution. Converge! Digest: So is the Nuage solution aimed specifically at those who want to sell cloud services? Manish Gulyani: It is designed for anybody who runs a large enough data center that needs automation. For instance, the University of Pittsburgh Medical Center, which is one of our trial customers, does not sell cloud services but they have enough internal users and external tenants that want full control over a particular cloud resource. If you can’t give them full control and automation, then the cloud resource is of no use. You have to be able to turn up the cloud service as fast as the user turns up a VM, otherwise the cloud service doesn't work. Whether it is a large enterprise, a web-scale company or a cloud service provider, all can benefit from the Nuage solution. Converge! Digest: What are the strategic differentiators versus other SDN controllers out there? Manish Gulyani: Some initial SDN solutions have come out in the last two years for data centers. They took the approach of virtualizing primarily at Layer 2, which was a good first step beyond the VLAN architectures. But in our view, this isn't sufficient to go beyond the basic applications. If you are limited to just Layer 2, you are not able to get the application design done the right way. For example, if you want to do a three tier application, you need to use routing, load balancing, firewalls – and all those elements in a real architecture are very hard to coordinate in current SDN solutions. So first, Nuage needs to overcome this obstacle. We give you full Layer 2 to Layer 4 virtualization as a base requirement. Once we’ve done that, the next issue is how do you make it scale? You can’t restrict cloud service to one data center. If you have ambitions of being a cloud services provider and you run multiple data centers, you want the power to freely move around server workloads between data centers. If you cannot connect the data centers in a seamless fashion, then you haven’t satisfied the demand. So our solutions scales to multiple data centers and provides seamless connectivity. The third obstacle we overcome is this: now that the cloud services are running, how can people on a corporate VPN get access to these resources? How can they securely connect to a resource that has just been turned up in a data center? We provide the full, seamless connectivity to a VPN service. We extend from Layer 2 to Layer 4, we made it seamless across data centers, and then we extend it across the wide area network by seamlessly integrating with MPLS VPNs. So that is our virtual connectivity layers. We also automate it and make it easy to use. A lot of our energy has gone into the policy layer, which lets the user define a service without knowing any network-speak. It’s just IT speak and no network-speak. This might seem strange for a networking company to say that its customer do not need to learn about VLANs or subnets or IP addresses – just zones and domains and application connectivity language. When a workload shifts from one data center to another, all of the IP addresses and sub-netting has to change, but real users can’t figure this out because it is too hard to do. If this function can just happen in the background, they’re good with that. The final thing we said is that it has to be totally touchless. The reason people are excited about the cloud is that it is quick. In fact, IT departments worry that users sign up for public cloud services because the internal IT guys can’t deliver quickly enough. If you need 10 new servers or VMs of capacity, why wait 3-4 weeks for your IT department to purchase and install the equipment, when you can log onto Amazon Web Services today and activate this capacity immediately with a credit card? The Nuage policy driven architecture basically says “turn up the VM, look up the policy, set-up the connection” – nobody actually touches the network. That’s our innovation. Converge! Digest: Since it is a software suite, what type of hardware do you run on? Manish Gulyani: Nuage runs on virtual machines. It runs on general purpose compute. Our Services Directory is a virtual machine on any compute platform. Our Services Controller runs on a VM. And our virtual routing and switching Open vswitch implementation is essentially an augmentation of what runs today on a hypervisor. You can’t go into a cloud world and propose new hardware because it is a virtualized environment. We have no constraints on what time of compute platform. The whole idea is to apply web-scale technologies. We also offer horizontal scaling, where many instances run in parallel and can be federated. Converge! Digest: Alcatel-Lucent is especially known for IP MPLS, and yet Nuage is largely a data center play. What technologies does Nuage inherit from Alcatel-Lucent that give it an edge over other SDN start-ups? Manish Gulyani: At Alcatel-Lucent, we learned a lot about building very large networks with IP MPLS. That is a baseline technology deployed globally to offer multi-tenancy with VPNs on shared WAN infrastructure. Why not use similar techniques inside the data center to provide the massive scale and virtualization needed for cloud services? We took our Service Router operating system, which is the software running on all our IP platforms, and took the elements that we needed and then virtualized them. This enables them to run in virtual machines instead of dedicated hardware. This give us the techniques and protocols for providing virtualization. Than we applied more SDN capabilities, such as a simplified forwarding plane that’s controlled by OpenFlow, which lives in the server and enables us to quickly configure the forwarding tables. Because of the way that we use IP protocols in wide area networks, we can support federation of our controller. That’s how we link data centers together. They talk standard IP protocols -- BGP – to create the topology of the service and the same way they extend to MPLS VPNs. As I said, the key requirement for enterprises is to connect to data center cloud services using MPLS VPNs they are familiar with today. This same SDN controller can now easily talk to the WAN edge router running MPLS VPNs. We seamlessly stitch the data center virtualization all the way to the MPLS VPN in the wide area network and provide end-to-end connectivity. Converge! Digest: Two of the four trial customers for Nuage announced so far are Service Providers (SFR and TELUS), presumably Alcatel-Lucent MPLS customers as well, and of course many operators are trying to get into cloud services. So, is that a design approach of Nuage? Build off of the MPLS deployments of Alcatel-Lucent? Manish Gulyani: It doesn't have to be. 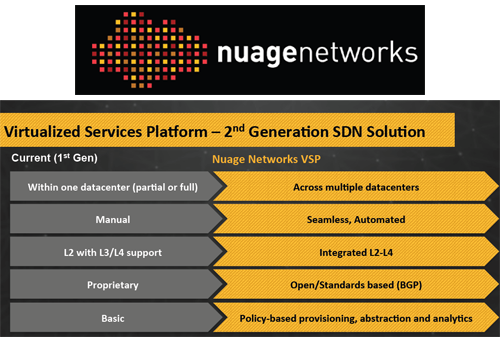 At Nuage, we don’t need for Alcatel-Lucent to be the incumbent supplier to sell this solution. But of course it helps if they already know us and and already trust us in running highly-scalable networks. So when we talk about scalablity of data centers, we have a lot of credibility built in. Both SFR and TELUS have the ambition to offer cloud services. I think they recognize that they must move to virtualization in the data center network and that the connectivity must be extended all the way to enterprise. Nuage can deliver a solution unlike anything from anybody else today. Existing SDN approaches only deliver virtualization in some subset of the data center, they can’t cross the boundary. Carriers want to have multiple cloud data centers, but they cannot connect their resources easily to MPLS VPNs today. We give them that solution. Converge! Digest: In cloud services, it’s becoming clear that a few players are running away with the market. You might say Amazon Web Services, followed by Microsoft Azure, Rackspace, Equinix and maybe soon Google, are capturing all the momentum. One thing these guys have in common is a desire to be carrier neutral, so they are not tied to a particular MPLS service or footprint. Will Nuage appeal to these cloud guys too? Manish Gulyani: We do. In fact, we are talking to some of these guys. As I said, Nuage is not designed for telecom operators. It is designed for people who want to sell cloud services and who run very large data centers. Carrier with multiple data center, like Equinix, will need the automation. Until you virtualize and automate the data center, forget about selling cloud services. Step 1 is creating the automation inside the data center. Connecting to MPLS VPNs is step 2. Amazon has been among the first ones, but they had to develop all of this themselves. There was no solution on the market. They build that step 1 automation themselves. We now know that Amazon found it quite cumbersome to get secure connectivity between clouds. They are also experiencing how hard it is to connect a corporate VPN into the Amazon cloud. It can be tedious. If others are going to offer services like Amazon, and they don’t have the size and wherewithal to figure it out themselves, then Nuage will get them there. Converge! Digest: On this question of data center interconnect (DCI), Alcatel-Lucent also has expertise at the optical transport layer, especially with your photonic switch. Will Nuage extend this SDN vision to the optical transport layer? Manish Gulyani: We sell a lot of data center interconnect both at the optical layer and the MPLS layer, such as DWDM hitting the data center and also MPLS in an edge router. We sell a lot of 100G on our optical transport systems because they really are the capacity needed for DCI. So that’s the physical connectivity. The logical connectivity is what you need to move one virtual machine in one data center to another. Even though the secure, physical connectivity exists between these data centers, the logical connectivity just is not there today. Nuage gives you that overlay on top of the physical infrastructure to deliver a per-tenant slice with the policy you want. Converge! Digest: How big is Nuage as a company in terms of number of employees? Manish Gulyani: We haven’t talked publicly about the size of the company or head count. Converge! Digest: About this term “spin-in” that is being used to describe Nuage… what does it mean to call Nuage a spin-in of Alcatel-Lucent? How is the company organized? Manish Gulyani: Spin-in means that we are an internal start-up inside of Alcatel-Lucent. There is a very good reason Alcatel-Lucent structured this as an internal start-up instead of an external start-up. Nuage leverages so much existing Alcatel-Lucent intellectual property, there was no way it could let this outside of the company for others to have. We would essentially have had to put out our Service Routing operating system for others to value and control the intellectual property and associate equity investments with it. This would have been too complicated. Others have tried to spin-out a new start-up with third party investors, only to find that they must acquire it back because they did not want their intellectual property to fall into the hands of others. Still, Nuage has full freedom to develop its solution and the right atmosphere to pull in the right talent. We need a good mix of networking people and IT people. We've been able to bring in guys who did Web 2.0 scaled-out IT solutions. Converge! Digest: So Nuage is not a separate legal entity that can offer stock options to attract talent? Manish Gulyani: No, Nuage is a fully funded internal start-up that is not a separate legal entity. The start-up identity separate from Alcatel-Lucent also enables us to sell into the new cloud market, which is a different space from what Alcatel-Lucent has traditionally pursued. So, we can go after different market, we can attract new talent but still leverage the existing intellectual property that is essential to really get a good solution to market. This structure gives us freedom in multiple dimensions. OTEGLOBE, a leading international telecommunications provider in Greece and the Balkans, has deployed Infinera's DTN-X platform to upgrade its TransBalkan Network (TBN), which stretches from Greece to Germany across more than 8,000 km of fiber routes. 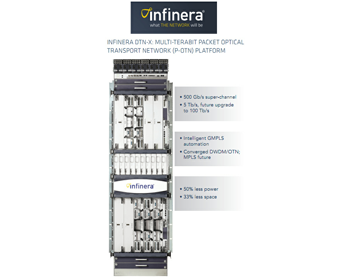 The Infinera DTN-X platform with 500 Gbps super channels enables OTEGLOBE to increase the available capacity on this network from 600 Gbps to more than 1 Tbps. At the same time, OTEGLOBE’s network is able to support 10 Gbps, 40 Gbps and 100 Gbps services to its customers, international carriers, fixed and mobile operators, and multi-site organizations. TIM Brasil has selected Nokia Siemens Networks to deploy an LTE network layer on top of the operator’s existing 2G and 3G networks in the 2.6 GHz frequency band. 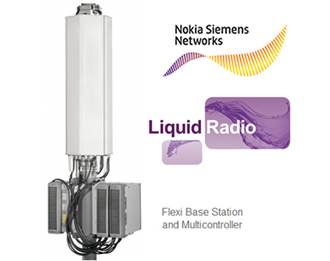 Under the contract, Nokia Siemens Networks will deliver an LTE radio access network featuring its Flexi Multiradio Base Stations. Nokia Siemens Networks will also upgrade TIM Brasil’s NetAct network management system to enable consolidated and effective monitoring, management and optimization of its network. SK Telecom announced the industry's first 802.11ac (5G WiFi) hotspot router. The product integrates Broadcom's BCM4708 and BCM4360, along with Broadcom's TurboQAM (256-QAM mode in 2.4 GHz) for faster throughputs. "SK Telecom is dedicated to leading the deployment of 802.11ac (5G WiFi) hotspot routers in Korea," said Choi Jin-sung, Executive Vice President and Head of ICT R&D Division, SK Telecom. "By partnering with Broadcom, the pioneer of 5G WiFi, SK Telecom will provide an upgraded Wi-Fi experience for our customers through differentiated technologies and services befitting the Gigabit Internet environment that is expected to expand rapidly from 2013." The U.S. General Services Administration (GSA) awarded a multiple year competitive contract known as GSA Region 4 Integrated Telecommunications Services (GRITS) II to Level 3 Communications. The contract allows Level 3 to bid on and provide communications services to all federal agencies and organizations authorized to use GSA sources of supply and services in the region. The fixed price with economic price adjustment (EPA) contract has a total estimated potential value of up to approximately $285 million, which includes the four-year base term with six additional option years. Forty years ago today, Martin Cooper placed the first public telephone call using a portable cellular phone. At the time, Cooper was general manager of Motorola's Communications Systems Division. He made the first call to his rival at AT&T's Bell Labs from the streets of New York City. Cooper went on to become founder and CEO of ArrayComm, which offers technologies for boosting spectral efficiency.